SharePoint forensics has become an important area for forensic investigators who work on investigation procedures involving the scenarios where the company has alleged one of its employee for intellectual theft acquisition. SharePoint works as a great assembler of data and so a sweeping amount of predominant data stored in SharePoint database can be a well-defined challenge for forensic experts. Any organization following the implementation of SharePoint farm depends on it for every possible task and this ranges from collaboration, sharing of documents to automation of business process workflow running with an organization. In such a case, investigators need to work on the calendars, contact information, tasks, lists that may contain probative evidence. However, one cannot escape the challenges that come in the path of forensic experts while examining data. 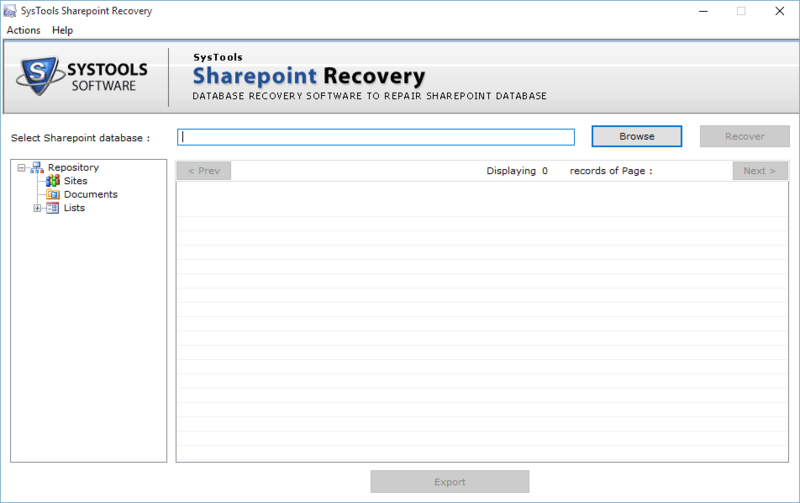 Recovering Corrupted Database Of Sharepoint: The challenge over here is how to make the database available for examiners that will help in scooping out sensitive data. Extracting data from the MDF file database of SharePoint server can provide important evidence that can change the course of investigation probes. SharePoint Forensics Database Analysis on Another Platform: The SharePoint database is saved in the MDF file format in the SQL Server. Once the data is recovered and exported back to the same SQL server in the environment chances are there that the data can be again manipulated by the people of an organization. Therefore, there should be a provision, where you can export the MDF file to some other SQL server and analyze data without any sort of discrepancies. In order to combat the challenges faced by forensic investigators, there needs to be a specific tool that can provide a comprehensive platform for recovering the database of SharePoint and analyze them in an independent manner. Upload the corrupted database of the SharePoint farm used in your organization and the application will work on its advanced mechanism to execute a complete recovery of the database. Complete Retrieval of Database Items: Examiners will get an opportunity to overlook at all the list and documents that may contain inculpatory evidence. This tool recovers all the triggers, tables, views, rules, list and other items associated with the SharePoint database. Scan Report For MDF File Repair: View the complete summary of the scan process along with the details of MDF file like the pages that were read, the name of a database, stored procedures, triggers, etc. • Save directly on SQL Server: Export the database directly to the SQL Server. • Save as MDF file: This will help investigators to export the recovered MDF file to some other SQL server and examiner data without any fear of evidence manipulation. Selective Export of Items: After recovering the database, investigators have the option to export only the items they require and not the whole database. Preview of Database: During Sharepoint Forensics, once the database is recovered, you will get a complete preview of the database along with all its attributes that include Site ID, Full URL, Parent Web ID, directory name, Leaf Name, etc. It must be remembered that the recovery process of SharePoint database should be carried out carefully otherwise investigators may lose access to some of the important evidence that is present in the lists, documents of the Sharepoint storage.